Law firms, government agencies, and multinational companies regularly hire K2 Intelligence for its innovative work in the field of investigations and compliance. 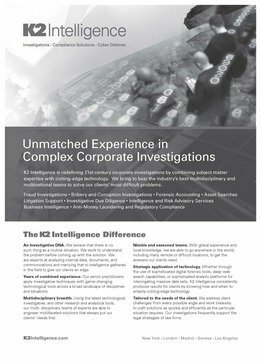 K2 Intelligence is an industry leader in forensic accounting. The team is composed of top-of-their-field experts in accounting, regulatory compliance, cybersecurity, and asset recovery. Jeremy and Jules Kroll created K2 Intelligence in 2009, first opening offices in London and then in Madrid. In 2010, the firm opened a New York office, now its headquarters. In 2015 the firm expanded again, opening a new office in Geneva, Switzerland. The firm acts for government enforcement authorities, law firms, and private companies, particularly in the energy, mining, real estate, construction, education, technology and finance sectors. Jeremy Kroll is the company’s CEO and president, while Jules Kroll is the firm’s chair. Robert Brenner, former senior investigative attorney at the rackets bureau of the New York County District Attorney’s Office, is K2 Intelligence’s chief operating officer and is based in New York. He was also a special assistant US attorney at the Attorney’s Office for the Southern District of New York. Brenner specialises in internal investigations and monitorships. He is currently the independent monitor for two financial institutions, which agreed settlements with the US Federal Reserve and the New York Department of Financial Services to resolve allegations of sanctions violations. He is joined in New York by Snežana Gebauer, who is an executive managing director for the Americas and head of US investigations. She has experience leading high-profile corporate investigations into corruption and fraud, and regularly provides pre-transactional due diligence advice to financial institutions and financial services providers. As well as working in the US, Gebauer has experience leading large-scale investigations in Brazil. In London, Darren Matthews is an executive managing director and heads the investigations and disputes practice. Matthews is a chartered accountant and a certified fraud examiner, and his work involves tracing where funds have come from. Also in London is Steve Holt, who leads the firm’s forensic and financial investigations team. He specialises in investigations into fraud, bribery and corruption, and assists clients in urgent cross-border issues. He has recently led an investigation into bribes allegedly paid to executives at a state-owned company and alleged bribery committed by a South American construction company. Veteran US investigator Bruce Goslin leads the firm’s Madrid office, where he covers investigations in Europe, Middle East and Africa. Goslin has over three decades of experience under his belt, and has led investigations into a wide range of white-collar crime over his career and has recently been advising EU-based financial institutions on the emerging risk of cyberattacks. New additions to the firm include Ken Yormark and Michael Carroll. Yormark is a managing director and leads the US-based forensic accounting team. He has worked on large, cross-border FCPA investigations, as well as financial services investigations, securities litigation, and anti-corruption risk assessments. Carroll is the managing director in its construction and real estate services team within the investigations and disputes practice in New York. During his time at the Department of Investigations, he oversaw criminal investigations into financial fraud, bribery and political corruption. K2 Intelligence advised the Winklevoss twins on the launch of their Bitcoin exchange platform, Gemini. K2 Intelligence helped the twins secure licensing approval from the New York Department of Financial Services and design anti-money laundering policies. The firm was appointed as “integrity monitor” for five years to oversee the compliance of the state of New York’s $3 billion investment in two major construction projects. In 2016, the firm completed one of the largest reviews of historic transactions. K2 Intelligence was hired by a US regulator to review 1.5 billion historic transactions and identify suspicious payments. Steve Holt led an internal investigation into a South American construction company during a government investigation. Holt’s team was tasked with reviewing financial transactions to identify illicit activity. Also in South America, the firm was hired by an individual under investigation for bribery by several international agencies. The firm reviewed the individual’s financial records. A Middle East financial institution also recently turned to the firm for help with its anti-money laundering compliance programme. The firm has been hired to conduct investigations on behalf of several government authorities, as well as multinationals and law firms. However, K2 Intelligence is rarely linked publicly to its clients. K2 Intelligence has two offices in the US, as well as offices in London, Madrid, Geneva and Los Angeles. It has been engaged to work on investigations by some of the world’s leading law firms. K2 Intelligence has led an asset-tracing investigation on behalf of the Bernie Madoff Ponzi Scheme Trustee, which was set up to recover money from the fraudulent scheme created by New York banker Bernie Madoff, who is currently serving a 150-year jail sentence after being found guilty of fraud, money laundering, perjury and theft in 2009. The firm has conducted a review of an Eastern European financial institution’s anti-money laundering and sanctions compliance programme. The review was completed by the firm’s London and New York offices. K2 Intelligence, an industry-leading investigative, compliance, and cyber-defence services firm founded in 2009, is redefining 21st-century corporate intelligence by combining deep subject-matter expertise with cutting-edge technology in an unprecedented way. We bring to bear the best multidisciplinary and multinational teams in the business to solve our clients’ most difficult problems. Across our practices and service offerings we help clients manage risk – whether it relates to investment, financial, regulatory, acquisition, new market entry, cyber, operation or reputation – gathering intelligence to enhance critical decisions. Our teams include former prosecutors, lawyers, regulators, compliance officers, law enforcement and intelligence professionals, forensic accountants, investigative journalists, technology professionals, and academics, each bringing a unique set of investigative skills and perspectives to the client situation. Headquartered in New York with offices in London, Madrid, Geneva, and Los Angeles, K2 Intelligence maintains deep, diverse global networks. We act as advisers to governments, companies, and high-net-worth individuals; our clients frequently include public entities and private companies across a wide variety of business sectors. Solution-oriented, not process-driven. We believe that there is no such thing as a routine situation. We work to understand the problem before coming up with the solution. We are experts at analysing internal data, documents and communications, and marrying that to intelligence gathered in the field to give our clients an edge. Years of combined experience. Our senior practitioners apply investigative techniques with game-changing technological tools across a broad landscape of disciplines and situations. This makes us well equipped to dig deep - and deeper - into every engagement we undertake. Independence and insight. We are proud of what we have come to stand for: good outcomes, honest outcomes, and a reputation not only for investigative, analytic, and advisory excellence but for independence and insight. Because of it we are trusted by governments around the world. Tailored to the needs of the client. We address client challenges from every possible angle and work tirelessly to craft solutions as quickly and efficiently as the situation requires. Our investigations frequently support the legal strategies of law firms. Multidisciplinary breadth. We bring together expert practitioners from a wide variety of disciplines to address the unique situations our clients encounter across an equally diverse landscape of industries and contexts. Using the latest technological, investigative and other research and analytical tools, our teams can engineer multifaceted solutions that always put our clients’ needs first. Nimble teams. With global experience and local knowledge, we can go anywhere in the world at a moment’s notice, including many remote or difficult locations. In addition to drawing on our own collective experience, we partner with a worldwide network of experts and practitioners in every field and capacity. This footprint allows us to service client needs wherever and whenever they arise. Strategic application of technology. Whether using sophisticated digital forensic tools, deep web search capabilities, or sophisticated analytic platforms for interrogating massive data sets, K2 Intelligence consistently produces unique results for clients.